For a student her age, Victoria Jones is exceptionally well-traveled. An Indiana University junior majoring in sociology and African American and African Diaspora Studies from Noblesville, Indiana, Jones has used her time at IU to travel to cities such as London, Paris, Cape Town, and Rio de Janeiro. Doing so has allowed Jones to experience the real-world applications of her studies and discover a love of international travel--experiences that would not have been possible without the support of the Office of the Vice President for Diversity, Equity, and Multicultural Affairs (OVPDEMA). Since she first signed up to study abroad through the OVPDEMA Overseas Studies & Scholarship Program, Jones’ relationship with cross-cultural learning has grown into a passion that has spanned multiple continents. Her travels first began in 2017 with a trip to Rio de Janeiro, Brazil, on a two-week summer program organized by the Overseas Studies & Scholarship Program. As part of the program, participants take an eight-week preparatory course that introduces them to the topics they will encounter firsthand while studying in the country. Due to the program’s focus on racial identity and the African diaspora in Brazil, Jones found it the perfect fit to explore her academic interests in an international context. “It was really cool to go over there and see that the history lives, to see how things from the past, like slavery, still affect individuals today,” Jones said. Throughout her time in Rio de Janeiro, Jones encountered real-life examples of the trends she had studied in the classroom. In tours of the city’s favelas and visits to community libraries, she examined the value of community organizing and processed her own role as an outsider to Brazil. At the same time, being surrounded by members of the African diaspora who looked like her was a familiar comfort, an experience that left her determined to continue exploring Brazil’s culture through a Portuguese minor. Ultimately, Jones aims to use her experiences as a foundation to return to Brazil in the future. If her trip to Brazil sparked Jones’ passion for international travel, it was her semester abroad that solidified the importance of study abroad in her future. With help from the Overseas Studies & Scholarship Program, Jones applied to the CIEE Open Campus Program, which allowed her to study in London, Paris, and Cape Town in the Spring 2018 semester. Doing so gave Jones the opportunity not only to examine cultures other than her own, but also to see the similarities that connected American culture to communities around the world. Through her study experiences on three different continents, Jones discovered a love for travel that she hopes will endure long into her future. The first step in this future will begin this November, when she will attend CIEE’s annual conference in Barcelona as one of three Americans invited to share the impact of her study abroad experience. 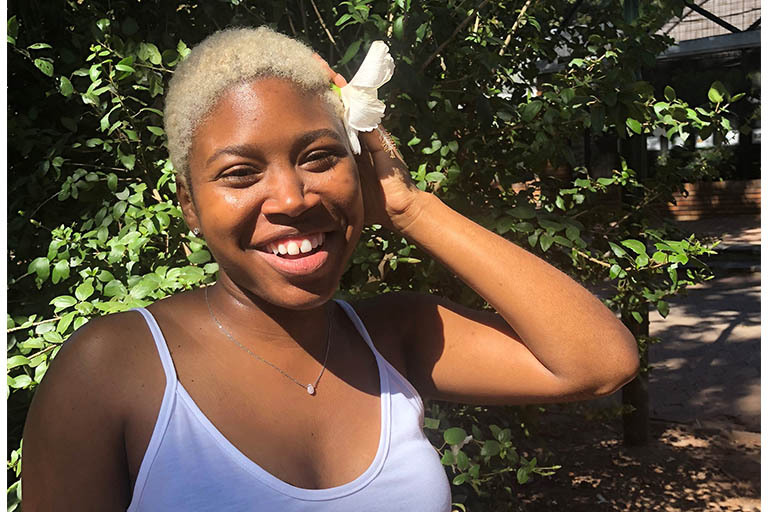 Beyond that, Jones plans to use her education to become a published author, which she hopes will allow her to help other students from historically underserved communities experience the transformational impact of studying abroad. “It’s really important not just to understand perspectives from a place you’ve never been before, but also to understand yourself better,” Jones said.